Lettuce dal or simple lettuce sambar can be made using fresh lettuce leaves, which is a very healthy, delicious and easy to make South Indian style soup/stew/grvay like dish which can be enjoyed with rice. 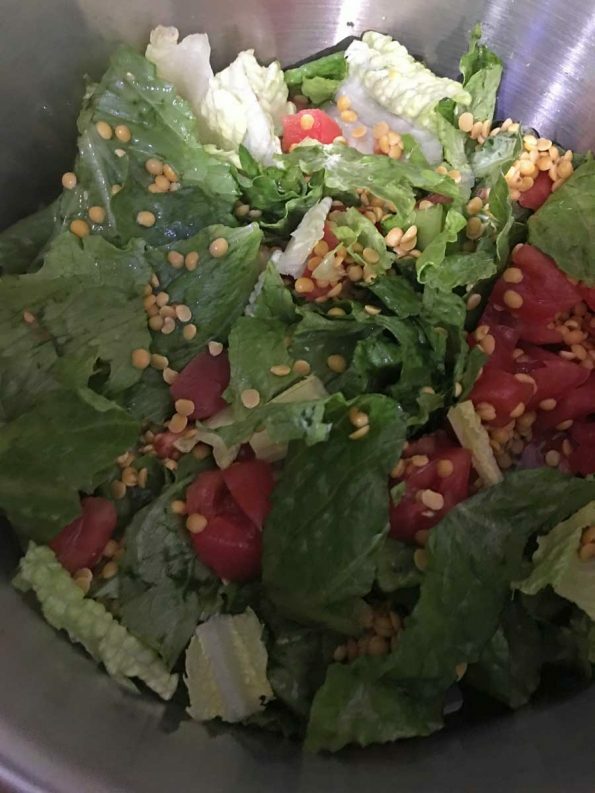 Toor dal (yellow split pigeon peas) is the dal we use to make this lettuce sambar. 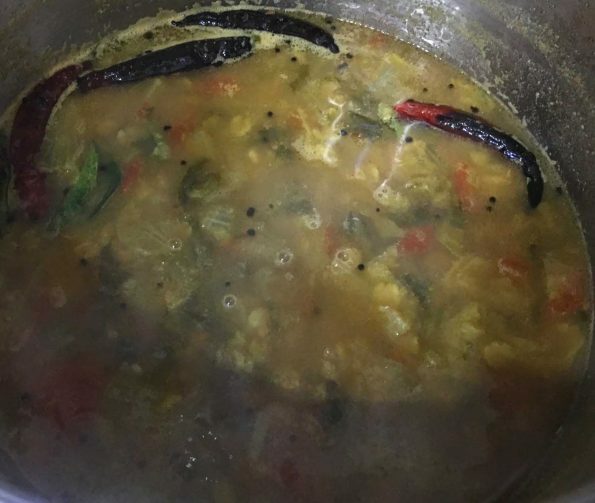 You can use sambar powder or use different spices like turmeric powder, red chili powder, coriander powder, fenugreek powder etc to make the sambar (you can also use a mix of sambar powder and different spices for enhanced flavors). I didn’t use tamarind in this sambar as I used tomatoes, however you may also add a little tamarind or tamarind extract for sourness. The consistency of lettuce leaf sambar is much like the consistency of a soup and so you can enjoy this as a soup itself if you wish. Lettuce is not very commonly used in South India to make sambar as mostly sambar is prepared using popular veggies that are used for making sambar. 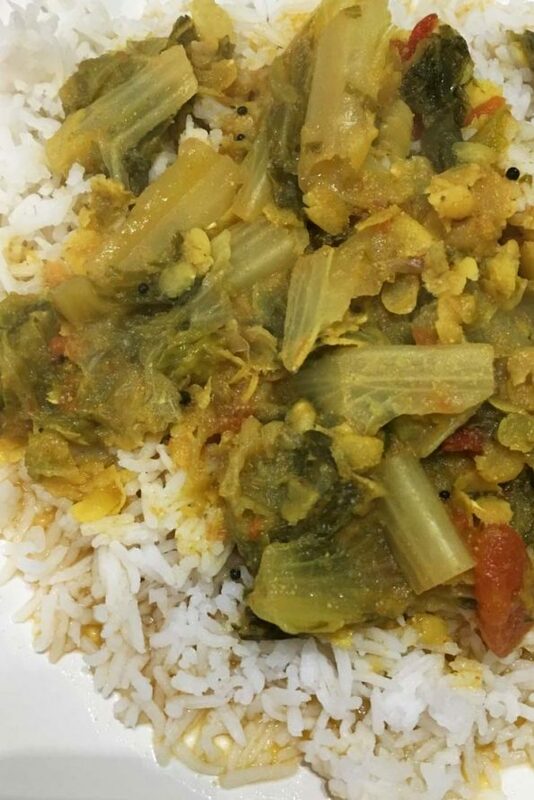 However this sambar made using lettuce leaves is so delicious so you can try this if you have lettuce leaves at home. In case you have a lot of leftover lettuce leaves at home, this is a very good way to make use of the extra lettuce leaves. 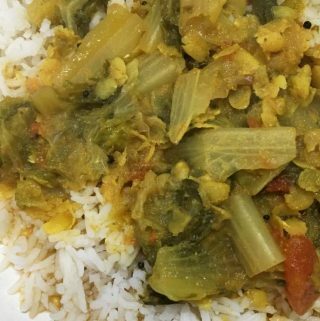 This vegetarian/vegan lettuce leaf sambar can be enjoyed with rice for lunch or dinner or you can enjoy this as a stew or soup. Lettuce is a green leafy vegetable with lots of water content. So I wouldn’t recommend adding more vegetables with water content, like cucumber for example. However I am not using tamarind in this recipe, so I am using two tomatoes also which will be enough for the sourness. If you want more thickness for the lettuce sambar, you may slightly increase the amount of toor dal used or you may also add two or three potatoes which should help to thicken the sambar. Adding one chopped carrot will also be good for this lettuce sambar. I kept this sambar so simple, so I used only lettuce and tomatoes, and it was delicious! So here is how you can prepare lettuce dal or lettuce sambar following this easy Indian style soup or sambar recipe. Lettuce sambar is easy, healthy and delicious lettuce dal recipe made in South Indian style using a lot of lettuce leaves. This is also a good way to use any leftover salad lettuce leaves! 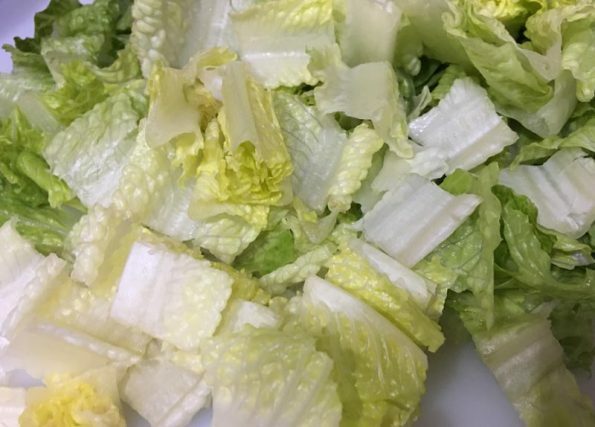 Separate the lettuce leaves, wash very well and chop in small to medium sized pieces. Keep the chopped lettuce aside. Wash and chop the tomatoes too, keep this aside with chopped lettuce leaves. 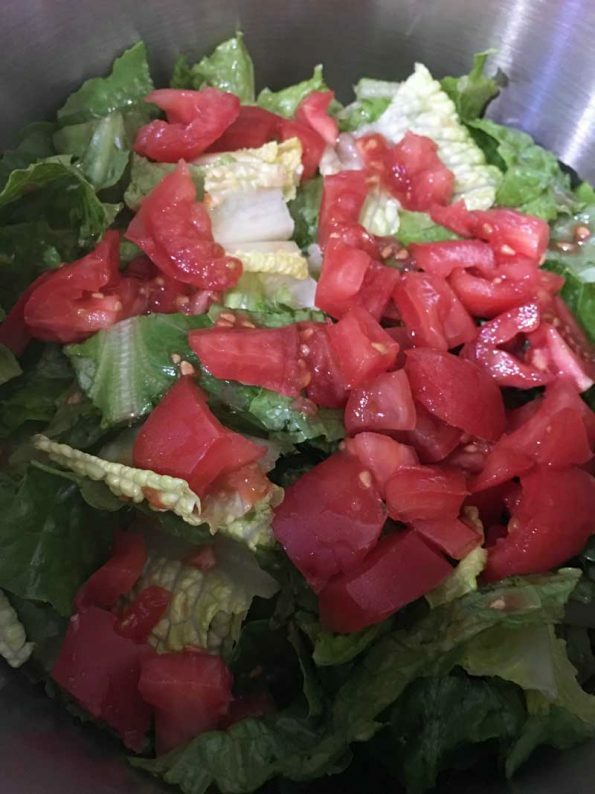 Transfer the chopped lettuce and tomatoes to a pressure cooker. Wash the dal and add it also to the pressure cooker. Add salt, turmeric powder, red chili powder, coriander powder, fenugreek powder (you can use ready made sambar powder instead of adding spices separately or use a mix of both if you like) and also water to the pressure cooker, mix everything well using a large spoon. Close the pressure cooker with lid and safety valve, cook for about 12 to 15 minutes in medium heat or until 3 whistles come. Wait for the pressure cooker to cool down. Once the pressure cooker is cooled enough, which will take few minutes, open the cooker and see if the lettuce and dal is cooked and soft enough. Just mix all contents very well and if you wish to thicken it more, you can heat the contents for another 2 to 3 minutes. Now the sambar is ready, let us prepare the seasoning. To prepare the seasoning for sambar, heat the oil in a small pan and add the mustard seeds. When the mustard seeds splutter, add the dry red chilies and curry leaves, fry for a few seconds. Pour this prepared seasoning over the sambar, gently mix in. 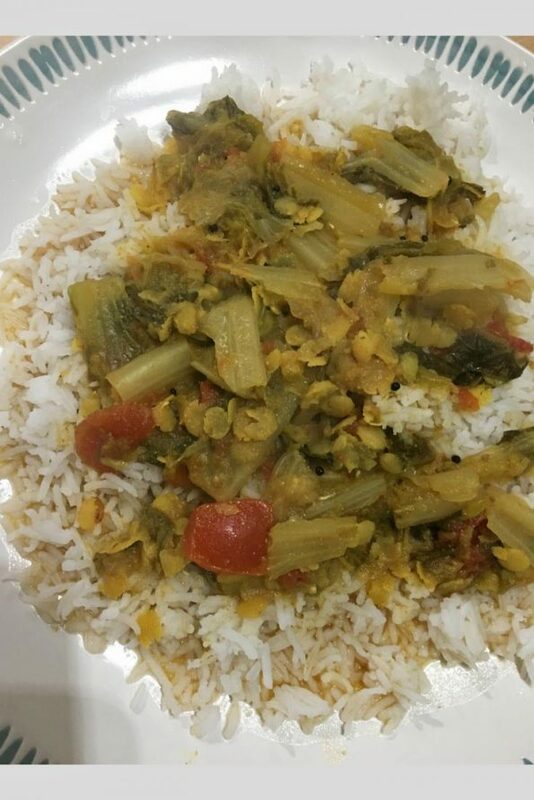 Lettuce is sambar is ready to be served, enjoy this with rice for lunch or dinner or you may also enjoy this as a Indian style spiced soup or stew as you wish. I didn't use tamarind in this lettuce dal recipe, but you can add a little tamarind paste or tamarind extract for increased sourness if you wish. 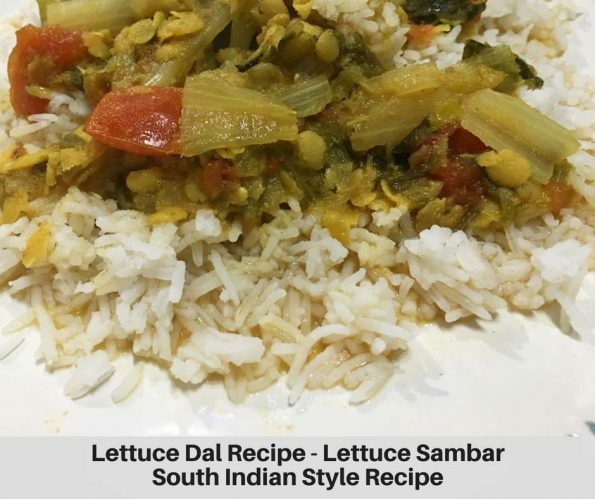 Hope you found this post on lettuce dal recipe or Indian style lettuce recipe for sambar helpful in making easy and healthy lettuce sambar!